Sage HRMS is the end-to-end human resource and payroll management solution for mid-size organizations that addresses today’s most pressing workforce-related business challenges. 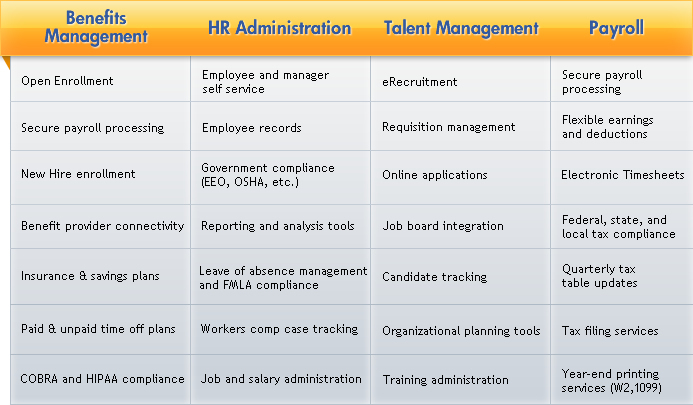 Drives costs out of business by automating core human resources, benefits and payroll processes. Meets current and future workforce needs to ensure continued business success-finding, developing and retaining the key employee skill-sets and attitudes. Contains and reduces the spiraling costs of employee benefits, the single largest workforce-related cost after salaries and wages. Reduces the costs of compliance and the risks associated with increasingly complex and burdensome government laws and regulations, including avoidance of fines and penalties and helping protect against costly litigation. Empowers you to make the best possible decisions regarding the workforce with accurate, timely and insightful workforce reporting and analysis tools. Balances the need for a high level of employee service for retention with the costs of providing it. Strength of Sage - Sage Group plc (SGE) Traded on London Stock Exchange; $1.6 billion revenue (2006); focused on business software needs of small and mid-size businesses; over 2.7 million customers $650 million revenue in North America. Strength of Dresser - Dresser & Associates is one of the Nations leading Solution Provider for HRIS Software. We have worked with hundreds of businesses to create tailored solutions that optimize their HR and Payroll processes delivering real return.